The sidings made up of fiber cement are considered to be a strong and durable option. These days the sidings made of fiber cement is the top choice of architects all over the world. This is so because the sidings made of fiber cement are the ones that have considerably low cost and they are a modern day strong and durable material. Architects have also been using sidings made up of fiber glass for the patching up of historical districts as well. There are different kinds of fiber cement sidings available in the market these days. Fiber cement sidings are available in different colors and sides also. There are different fiber cement siding styles used all over the world. Some shape styles that are available in modern day fiber glass sidings are Perfection shingles, Random square straight Edge, random square staggered edge, half rounds, octagons, scallops, individual shakes. There are different styles in terms of lap siding made of fiber cement as well. Some of them are Cedar lap siding, smooth lap siding, smooth beaded lap siding, textured beaded lap siding, textured Dutchlap siding. There are different styles available in terms of vertical sidings as well, they are smooth, stucco Cedar 8 Groove, Cedar No Groove, etc. The options available in fiber cement siding styles and colors are in plenty. 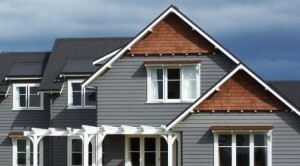 The color palette of the fiber cement siding includes Heritage Gray, Linen, Blue, Prairie wheat, sandstone, white, green, clay, red, Almond, Vanilla White, Silver plate, Antique White, Butter, Merino Tan, Wicker, Heritage clay, heather, Nantucket gray, Olive, Pewter, Desert Gold, Coastal Blue, Autumn Red, Newport Taupe, Light Mist, Sail Cloth, Navajo Beige, Monterey Taupe, Arctic White, Autumn Tan, Sandstone Beige, Heathered Moss, Woodland Cream, Khaki Brown, Woodstock Brown, Booth Bay Blue, Cobblestone, Harris Cream, Mountain Sage, Evening Blue, Tuscan Gold, Traditional Red, Timber Bark, Parkside Pine, Iron Gray, Country Lane Red. Wood grain fiber cement siding is available in colors that include Redwood, Mahogany, Maple, Cedar, Emerald, Slate, etc. There are different styles of fiber cement siding as well. These styles include Smooth, Colonial Smooth, Beaded Cedarmill, Select Cedarmill, Beaded Smooth, Rustic Cedar, Colonial Roughswan, Cedarmill, Sierra, Smooth, etc. Exterior fiber cement siding are available in many styles, textures, colors, patters, shapes and sizes. You have many options to choose from. You can choose whichever kind of fiber cement siding that you like. But then you must be very careful about some factors when you are choosing the perfect Fiber Cement Siding for your house. You must keep in mind the climatic conditions of the place where your house is. You should calculate that weather in adverse climatic conditions this fiber cement siding will be able to protect your house or not. As it is fiber cement siding is very strong and durable. This is the reason it is one of the most popular siding options around the world. You must choose the siding which is economical and budget friendly. You must choose the kind of fiber cement siding which is easy to install and absolutely fuss free. The most important point here is the maintenance. You don’t want to waste a lot of time in taking care of the siding only. And this is why you must choose that kind of fiber cement siding needs very low maintenance. We have discussed about the different style and color options of fiber cement siding. We have also discussed style and color options and different kinds of fiber cement sidings that are available today. You can easily choose from the available options as per your requirements.